Obviously, the strength of your grip says a lot about the health of your musculoskeletal system. If your grip strength is weak, it could be an indicator of serious problems brewing. As we age, our grip strength naturally decreases to some extent, but if it’s rapidly deteriorating, it could be an early warning sign of disorders like osteoarthritis or rheumatoid arthritis. Hand weakness in young people can indicate the early onset of arthritis, or it could mean you’re suffering from orthopaedic problems like tendonitis, repetitive strain injuries, or even nerve damage. In all cases, the sooner you can get a diagnosis, the sooner you can begin treatment. If you’re experiencing hand weakness, it’s best to get to a doctor right away to find out what’s wrong. A 2015 study published in The Lancet unearthed an even more alarming potential cause of weak grip strength. This study found a link between weakness in the hands and increased risk of heart attack and stroke. Researchers believe this link may not be direct, but that grip strength is a good indicator of overall health in the cardiovascular system and is associated with people who get regular exercise. So if you find your grip strength is decreasing, it may be time to talk to a doctor about a fitness routine that can safely increase your muscle mass and improve your overall health. Stretching helps lengthen muscles and tendons. Some repetitive tasks, such as typing on a computer or gripping gardening tools, can shorten muscles and leave them tight and painful. Do these stretches gently, until you feel the stretch, but without pain. Hold the positions for a count of 15 to 30 seconds to get the most benefit. These exercises are particularly helpful for tendinitis and tight forearm muscles, which are common in people who do a lot of computer work. For each of these exercises, do a set of four repetitions, twice a day. Hold the stretch for 15 to 30 seconds and rest for 30 seconds between each repetition. Hold one hand at chest level with the elbow bent. With the other hand, grasp the thumb side of the hand and bend your wrist downward. 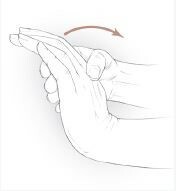 To increase the stretch, bend your wrist toward your little finger. Repeat the same exercise with a straight arm. Grasp the fingers of that hand with the other. Pull the hand back gently. These exercises work muscles against resistance. Hold each position for 10 seconds. Complete one set of 10 repetitions once or twice a day. Hold one hand palm down on a table or other surface. Put your other hand on top of it. Try to raise the lower hand, but don't allow it to move. Follow the same steps as above, but with your palm facing up. The next time you meet someone new, think about what your handshake is telling them. Not only does a weak handshake make you seem less trustworthy, it can also mean serious health problems are coming up down the road. If your grip strength is declining, be sure to talk to a doctor right away. Assuming you take steps to get your health in order, the next hand you shake may be your doctor’s, when they give you a clean bill of health!